Generally speaking, the ultra-conservative crowd isn’t spending their free time volunteering with PETA. 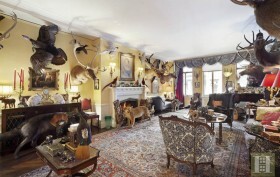 So it’s quite fitting that Fox News host Kimberly Guilfoyle just picked up the infamous taxidermy-filled apartment in the Beresford. Fortunately or unfortunately, depending on your thoughts on decorative dead animals, the long-time owner, journalist Gregory Speck, is sending his massive collection of stuffed friends to the Virginia Museum of Natural History, according to the Post. And Guilfoyle has already hired architect Campion Platt to renovate the two-bedroom, “classic six” home. Lucky for us, though, it’s not too late to see the bizarre (or some may say terrifying) Central Park West home. We were quite astounded when, earlier this summer, we came across a taxidermy-filled apartment on Central Park West (there’s a first time for everything!). And now, in an even more surprising twist, we’ve stumbled upon another “stuffed animal” loving pad. 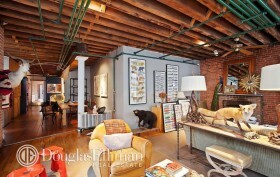 Though not filled to the brims like our first find, this apartment at 465 West Broadway will still make you look twice. The three-bedroom unit has been picked up by jewelry designer and artist Lisa Pevaroff for $4.7 million. Likely selling points include 15 windows, four exposures, and an easily convertible floor plan.